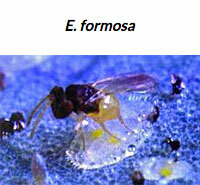 This tiny parasitic wasp is the most cost effective biological control for the greenhouse whitefly. 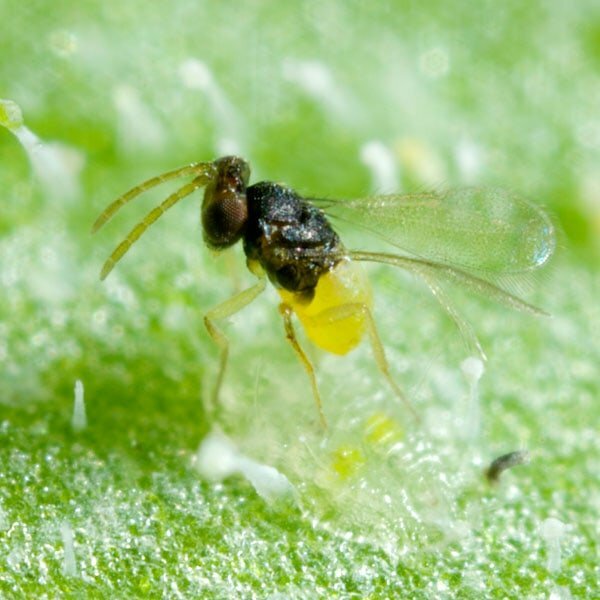 Whiteflies are harmful to both outdoor and indoor plants by sucking plant sap. Under certain conditions, they can also transmit disease. 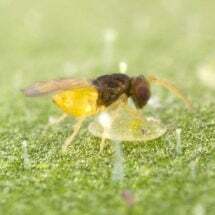 The whitefly parasite (Encarsia formosa) lays its eggs — as many as 50 to 100 — in both pupae and later larval stages of the white fly, destroying them before they can become adults. 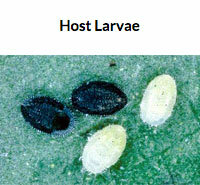 The host larva turns black as the parasite develops. It emerges, depending on conditions, in about two weeks. The adults will also feed on the larval juices released when they puncture the larvae. Shop our large selection of beneficial insects, including whitefly parasites, at Planet Natural. One strip of cards — 500 parasitic wasps — treats up to 250 square feet and costs $29.50 with USPS Priority Mail shipping included! Attracted to the flies by the smell of the honeydew they produce, E. formosa is an efficient biological control of whitefly and one of the most cost effective ways to control greenhouse and indoor infestations of the pest. Humidity and strong light encourage the parasite’s activity. Temperature is also key as the parasite will not fly and seek out new prey at temperatures under 62 degrees. Its preference for warm, humid, well-lit conditions make the whitefly parasite the perfect solution for indoor and greenhouse whitefly problems. Whitefly parasites are shipped as mature pupae in host eggs, glued to a paper card and almost ready to hatch as adult parasitic wasps. If pest levels are high, use a least-toxic, short-lived natural pesticide (insecticidal soap, botanical insecticide) to establish control, then release beneficials 2-3 weeks later to maintain control. The greenhouse whitefly is a major pest problem in commercial greenhouses, attacking cucumber, paprika, tomato and many ornamentals. The female lays her eggs on the undersides of young apical leaves, often in circles on hairless hosts. The eggs hatch after about 8 days while further development consists of 1st, 2nd, 3rd and 4th instars and pupae whose development occupies an average of 20 days. The newly hatched larvae are initially mobile. They move for a few hours only and then settle down. After inserting their mouthparts into the leaf tissue, they lose their functional legs and remain static throughout the remainder of their development. Once the whitefly emerges, it will start laying eggs within 1 to 2 days, thus repeating the cycle. 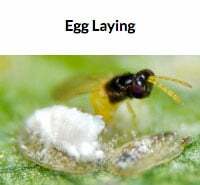 Egg production increases with increasing density of whiteflies per leaf; it is also greater at higher temperatures. A temperature of 70° Fahrenheit and humidity of 75% – 80% are considered optimal conditions for the pest.